What did you think of The Prestige? A movie about magic, illusions, and a long, twisted story that you’ll kick yourself at the end, for not figuring out. The Prestige comes across as the story of David Copperfield’s life, from the trailer. Well, not really, but you get the impression that it’s all about the magic, and you’ll see magic trick after magic trick. Not entirely the case. The story of The Prestige is more along the lines of an epic battle to be the best, competition, life, and a little bit of magic. Though it’s lengthy, and at times boring, we get taken on a sort of out of order story telling ordeal, through the lives of our two main magicians, and their accomplices. We learn about their careers, how they started, where their rivalry came from, and what’s happened along the way. Rupert Angier (Hugh Jackman) is on a path for revenge against Alfred Borden (Christian Bale), after a tragic accident ends up getting Angier’s wife (a magician’s assistant) killed, in a water tank escape gone wrong. Angier vows to prove to himself, and the entire world, that he’s a better magician than Borden. Angier takes a trip to America, for two years, to find Tesla, the man who supposedly made the machine for which Borden uses for his “greatest trick”, the “Transported Man”. The trick itself, is pretty cool, you’ll have to see the movie, to see what I mean. Had this been a real magic trick, I’d be impressed, but rest assured, it’s just movie magic. The story is well crafted, though I felt the end was very Hollywood, with the “Explanation wrap-up” segment, where our main character explains everything to the other main character, about how he did it, and why, and when, and all that. I felt the movie could have ended a few minutes before that. Not because of length, or anything, but just because the story would have ended better with the “abra cadabra”, and then the gunshot. To me, that would have been a much better, and less Hollywood ending. Though, on the ride home, I was told that if that happened, I would have been pissed, and written about how “nothing was explained”, which is probably true. The writers (Jonathan and Christopher Nolan) do an amazing job of not only holding your attention through the 2 hours and 8 minutes. Their story turns, and winds, and weaves, and bobs, to the point where you don’t know who’s who, and what’s what. The story leaves you guessing, very much through to the end, where everything’s finally put on the table. You get taken for a ride, and at the end, that ride thoroughly gets explained. There are quite a few turns to this movie, while the typical Hollywood type movie gets one big hoorah at the end, and that’s it. The last half an hour of The Prestige, give or take, is all about explanations. You learn things that you weren’t expecting to learn, mainly because somewhere deep down inside, you’re still holding on to the “it’s really all magic” idea. Well, I can tell you, for sure, it’s not magic. There is indeed an explanation to the entire thing. I won’t tell you what, just refer you to see the movie. The bottom line, this movie is excellent. You should absolutely see this movie, and support it in any way you can. I had hoped I would love the movie, and I did. While I disagree with parts of it, and various storyline aspects, overall, I loved the movie. I thought it was beautifully acted (aside from some less than favorable British accents), magnificently written, and marvelously directed. Christopher Nolan has not only proven to be an amazing director, but also a talented writer. If you liked any of his other movies, you’ll fall in love with The Prestige. I have a question concerning the scene where Angier goes in the transporter for the first time. Why does he assume that the original of him will be left in the transporter. Obviously this is the case because he keeps his gun close to the stage. I assume, though we don’t actually see this, that Angier plans to shoot the copy and does in fact shoot the copy. Or, in fact did the first copy in the transporter actually kill Angier. The transported Angier says something like, “Wait, I’m the …” I assume that the transported Angier was going to say “original”. But, in the film, where two Angier’s live, how can we tell which is the original and which is the copy? I still have a hard time getting my head around the idea that Angier is willing to take a chance on drowning every night in the film in order to do his trick. So, could Angier have come to the conclusion that the orginal gets transported and the best way to kill the copy is to have the water tank under the trap door from the stage to drown the copy each night. 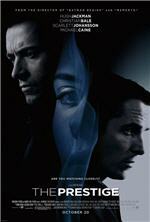 I’ve enjoyed reading all of the posts concerning the film “The Prestige”. I feel that reading the synopsis of the book (at Wikipedia.com) “The Prestige”, from which the film was adapted, has helped me to better understand the film. Obviously reading the book would bring even a greater understanding. And, I plan to do that. Just knowing that the book won the James Tait Black Memorial Prize for best fiction and the World Fantasy Award for Best Novel tells me a lot. This is not a book that plays by the rules as far as real science in the world. This is a fantasy. And, in a fantasy you can have machines that make copies of living things. In the book we learn that Alfred Borden is actually the name used by identical twins namd Albert and Frederick. Also, Rupert “Robbie” Angier, with help from acclaimed physicist Nikola Tesla creates a machine that can transport a being from one place to another. The book differs from the movie in that in addition to teleporting a being from one place to another the now lifeless body of the original subject is left behind requiring Angier to develope a way to drop the bodies out of sight to make the show more effective. I found it interesting that in the book Angier refers to the dead bodies as “prestiges”. In the film Tesla chains down his cat to the stage and the cats that appear outside don’t have a chain (Right?) So, could it be that the transporter or copier does not transport/copy metal? That would explain Angier taking off his wedding ring before being transported. I guess the electrical type process may also cause burns to a living thing wearing or attached to metal. But, I haven’t seen any discussion concerning the possible problems with metal in the transporter. Do you have any opinions on this?